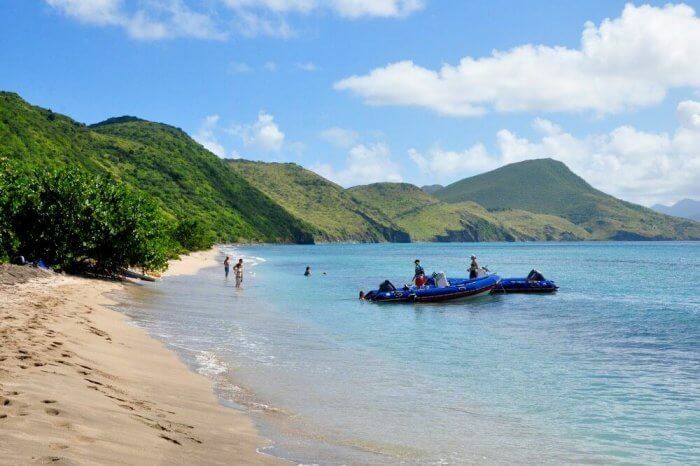 Looking for a Carambola Beach Club St. Kitts Day Pass? You’ve come to the right place. During my 7-night sailing cruise around the Windward Islands of the Caribbean on the Royal Clipper, I was torn between exploring the ports we stopped at or hunting down an Internet cafe. Much like any boat in the middle of a sea, the onboard wifi was slow. Although I’d tried to clear away any work in advance, a flurry of urgent emails always seemed to be fluttering around the edges of my day. 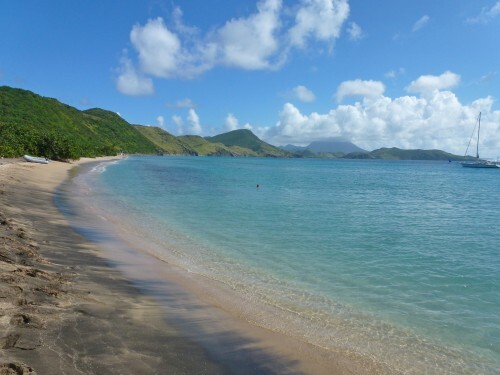 With a day pass to the Carambola Beach Resort on the island of St. Kitts. I was able to do both. Plus, there was little risk of getting my beach bag snatched (more on that later). Because I was travelling solo and toting a laptop, two cameras, a notebook, a change of clothing and more, I wanted a deck chair near an attendant to watch my stuff while I took a walk. In St. Lucia, I’d been in the water swimming when two guys had made a mad dash for my bag on the beach. I stumbled out of the water yelling and scared them away but other people down the beach weren’t so lucky. 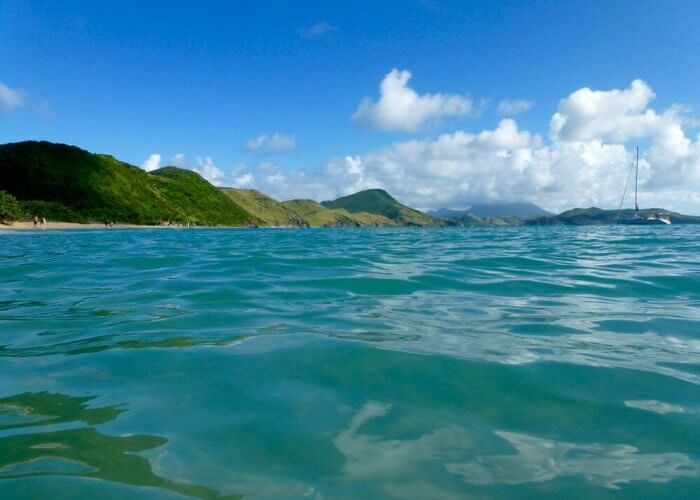 On St. Kitts I really did want to walk, swim and leave my laptop behind — South Friar’s Bay offers beautiful clear waters that are perfect for snorkelling (and green turtles). A Beach Club seemed a perfect solution. 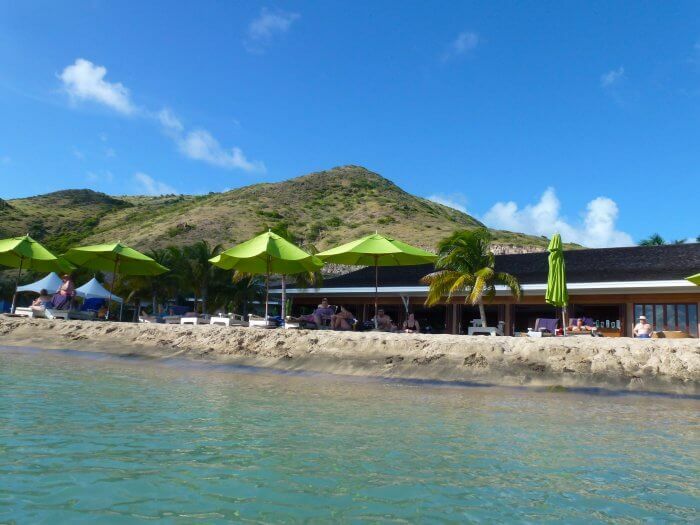 The Carambola St. Kitts Beach Club is a fine-dining, 128-seat restaurant by night, but by day is a beach club offering lunch and resort day passes (on cruise ship call days). This means you can rent a chair and umbrella, lounge on the beach, use the swanky facilities (showers, change rooms, washrooms) and enjoy a casual lunch and drinks at the restaurant /bar. Leaving my gear under the watchful eyes of a chair attendant, I floated in the clear blue water without fear, deciding that Caramabola Beach Club is a great option if you’re travelling alone and want to enjoy a swim without having to pop your head out of the water every 5 minutes looking for perps. I know there are such things as anti-theft swimming devices but I’ve yet to see one that fits a credit card and a pair of glasses. I also managed to enjoy a long walk along the beach at Friar’s Bay and, although I didn’t spot any monkeys or green turtles, I did discover Shipwreck, a rustic beach bar offering inexpensive drinks, friendly locals and rather rickety chairs but plenty of atmosphere. The lunch menu ( on cruise ship call days) features popular beach fare such as burgers, grouper sandwiches, pasta and BBQ ribs, but there’s also a nice selection of local Kittitian dishes such as pumpkin soup, jerk conch and a healthy combo of leafy lettuce topped with tender Caribbean spiny lobster. Dinner is much more elaborate ( and pricier) but it’s worth the splurge to sample dishes such as the beef tenderloin in a blueberry reduction and a creamy caribbean lobster thermidor. There’s even a kid’s menu if you’ve got little ones with you. The Carambola Beach Club is also home to one of the most extensive sushi menus in the Caribbean. Check the Carambola Beach Club Facebook page for details on theme nights, New Year’s Eve parties and Happy Hour specials. – Cost for a chair rental at Carambola Beach Club is $10 and if you want an umbrella, it’s an extra $10 USD. – If you arrive with a group of six people or more, it may be possible to negotiate a discount. – Wireless internet is free and works best the closer you are to the interior/lobby bar area. – Interior decor space is upscale with Indonesian teak hardwoods and open, airy dining sections. – Unlike a full Resort Day Pass in Mexico, drinks, towel service and meals are NOT included. – Carmabola Beach Club has its own swimming pool, carved out of the ocean, handy if the ocean is rough. – Taxi from the cruise port is $16 one-way (this was told to me by another guest so hasn’t been verified). Carambola Beach Club opens daily at 11:00 a.m. It is only open for lunch on Cruise Ship days, so call ahead of you’re not on a cruise ship. You can reserve in advance for dinner online. Note that Carambola Beach Club closes during the summer. 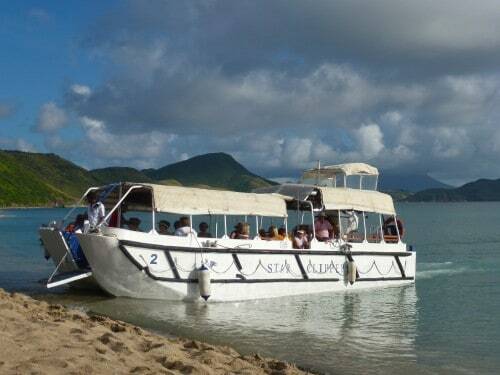 Another alternative to an organized shore excursion is the St. Kitts Marriott Resort and Casino. 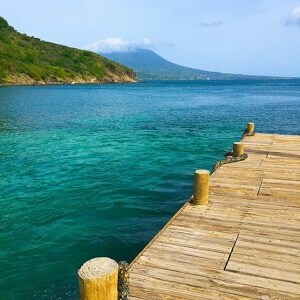 Love St. Kitts! Thanks for sharing as I definitely would try this place out on a future visit. Thanks for your comment Marian! And I’m definitely going to check out your post on “Travel and Dieting. Is it possible?” I’m headed to Anguilla and already thinking about what to eat! What a gorgeous beach! And so true about not wanting to leave one’s bag unattended on any beach. Even if I don’t have a laptop or camera with me, I always worry about leaving prescription eyewear in a bag on a beach while I’m swimming. The beach club sounds a perfect, relaxing solution. 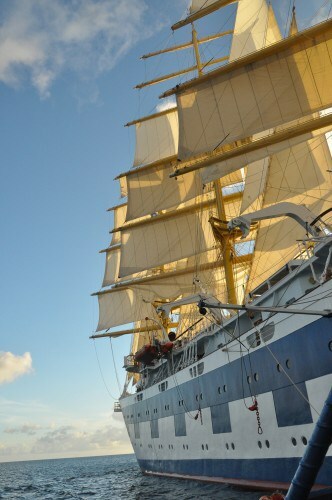 What a beautiful ship and so handy to get to the beaches. Good tips re beach safety! I’ve done this, too — the Windward Islands cruise on the Royal Clipper, the stop at Carambola, the push-pull over wi-fi — and jeez, Michelle really gets it exactly right. Good save with the bag! I would have been freaked out completely. I never thought of it before but a day pass at a resort makes sense for a solo traveller. Though you’d still need to watch your stuff, I suppose. I lost 80 Euros in an upscale hotel spa in Europe – people, use your lockers!